Shoot It Up is a mini basketball redemption game from Andamiro. 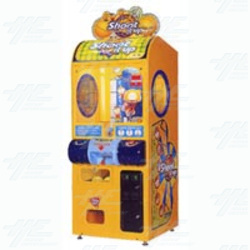 The skill based game offers prizes in the form of tickets or capsules when the player achieves or exceeds the set points of the game. A jackpot bonus is also available. The cabinet for Shoot It Up has a unique and colourful design which uses a shooting lever to shoot the basketball at the moving basket. Shoot It Up is a mini basketball redemption game from Andamiro. The skill based game offers prizes in the form of tickets or capsules when the player achieves or exceeds the set points of the game. A jackpot bonus is also available. The cabinet for Shoot It Up has a unique and colourful design which uses a shooting lever to shoot the basketball at the moving basket.